the place where love resides." 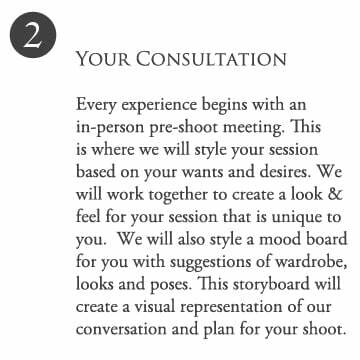 Every experience begins with a complimentary pre-shoot consultation. This is where we get to know each other and talk about the style of imagery you are dreaming of creating. Whether it is a Contemporary Fashion Style Beauty session or an Intimate Boudoir Collection, or you may even opt for a combination of both. We will discuss clothing, how to prepare for your experience and select the type of styling for your hair and makeup. We can create mood boards of inspirational images for you to help design your dream photoshoot. You will go home with a Welcome Packet which contains tips and tricks for you ...it even has a checklist so you don't forget anything on the day. We plan as much as possible at this meeting, so on the day of your shoot you can just relax, have fun, be pampered and feel gorgeous..
Once you arrive at the studio we will get you settled with a beverage and prep you for your makeover, during this time we will go through the outfits you have chosen, (you also have the opportunity to select pieces to wear from the studio wardrobe). Your styled session allows for 3-5 outfit changes. This is also when your Conceptual Art Piece will be photographed (if you have chosen this option). Once your photoshoot is complete we will arrange a time for you to come back to the studio to view and order your beautiful heirloom prints. ** We reserve the right to change our service and product's prices at any time without further notice. However, if you have ordered but not yet paid for a product, we guarantee the price for one month from when the order was placed.